Qualcomm already has a 5G modem announced, the X50 that will likely land in the next generations of phones with the ultrafast, low-latency cellular connectivity from LG, Motorola, OnePlus and others that are "committed" to the platform. The X50 will probably be crafted with the new 7nm EUV chip-making process of Samsung, reducing its potentially chubby footprint that needs to accomodate every radio and frequency under the sun without interference. Now, however, it announced further miniaturization, this time of the 5G antenna module that is no less important for stellar 5G performance than the modem itself. The so-called QTM052 mmWave antennas are shrunk even further compared to the previous generation, and now a smartphone can fit up to four inside its casing, and couple them with the Qualcomm Snapdragon X50 5G modem for better reception. 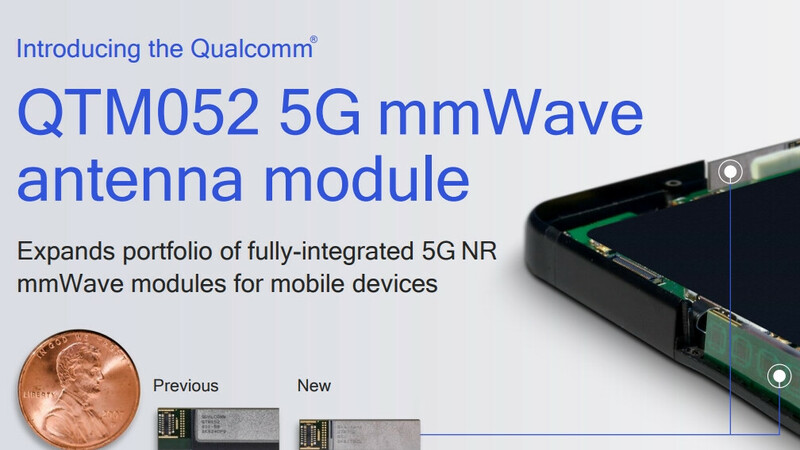 At Qualcomm Technologies, we’re constantly looking for ways to innovate and revolutionize the mobile experience, and we’ve done that with the QTM052 mmWave antenna modules, which build on a major milestone that we introduced in July 2018 – the announcement of the first commercial 5G NR mmWave and sub-6 GHz RF modules for smartphones and other mobile devices. We are dedicated to providing OEMs more versatility in their 5G smartphone form factor offerings, and that’s made possible through Qualcomm Technologies’ groundbreaking innovations in miniaturizing 5G NR mmWave modules. This milestone reinforces leadership of Qualcomm Technologies in enabling the path to 5G commercialization in early 2019. Most Android makers have already tipped that they have 5G handsets coming down the pike, promising to out them by early 2019, so smaller antenna modules will be a welcome news for them, too. More antennas = more radiation. Couple that with a new ultra fast charger for your phone and you can lower the lifespan of everything at once (including yourself). Problem with 5g is it travels much less than 3g & 4g, so needs way way more Ariel's to be installed. Already have patchy 3g & 4g in a lot of the UK, that needs fixing first.